Mass graves believed to contain the bodies of Bangladeshi and Rohingya migrants were found in the border town of Padang Besar in Malaysia's Perlis state on Sunday, despite the country's Home Ministry previously denying there were holding camps and mass graves on its side of the border with Thailand. Many of these "boat people", who are currently languishing in boats out at sea, had been abandoned by people smugglers spooked by Thailand's ongoing crackdown on human trafficking. In a U-turn last week, the governments of Indonesia and Malaysia said it would accept the migrants instead of turning them away, on the condition that they are resettled or repatriated within a year. Thailand has called for a May 29 regional summit to address what it called an "unprecedented increase" in migrant arrivals but Myanmar has said it would not attend it. The Straits Times takes a look at the plight of these "boat people" and explores in-depth the root of the problem and what it means for Asean. Malaysia said on Thursday that it believed 139 people were buried in graves at remote detention camps used by people smugglers on the Thai border which were discovered on the weekend. "Based on the size of the graves, and after the area was cleared... we have a clearer indication - single grave, single person," Deputy Home Minister Wan Junaidi Tuanku Jaafar told reporters. When asked by AFP if he believed that there were 139 bodies since Malaysia had previously said it had discovered 139 grave sites, Wan Junaidi said: "Yes". Villagers in Malaysia's Kampung Wang Kelian have been bumping into Rohingya migrants and members of the people smuggling syndicate in recent years. They said some of the migrants had come out of the jungle to beg for food and others to pray at a nearby mosque. According to them, the syndicate members would transport the migrants across the border at night when there were fewer security personnel. 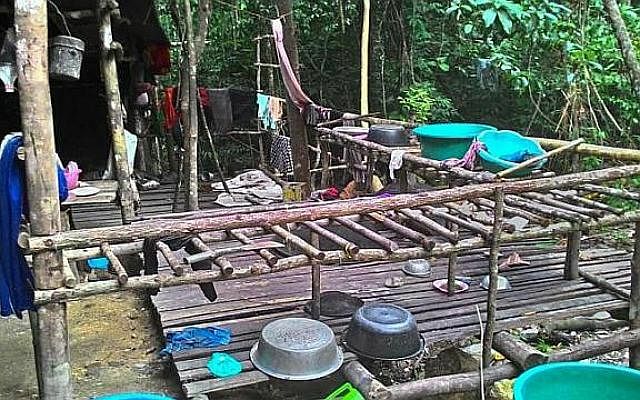 Thai police are seeking help from villagers living near a recently uncovered network of jungle camps to aid their investigation into people-smuggling and human trafficking-gangs, a senior officer said on Wednesday. Suspicion has fallen on remote communities in the deep south whom rights groups say must either have been aware of the trade, or have been actively involved in it. 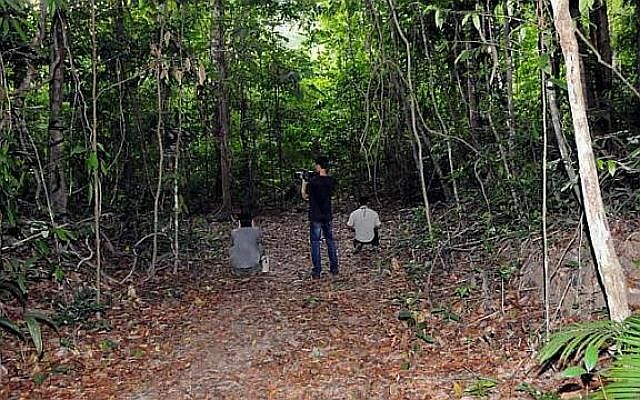 Seven camps have been uncovered in Songkhla province close to the Malaysian border, highlighting the country's crucial role in the regional smuggling trade. Twelve police officers have been arrested for alleged links to the mass graves found near the Malaysia-Thailand border, Malaysia's Deputy Home Minister Wan Junaidi Tuanku Jaafar said on Wednesday. Datuk Seri Wan Junaidi told parliament the officers had been nabbed in three operations since last year for suspected involvement in human trafficking. Four were arrested by the police while eight others were arrested by the Malaysian Anti Corruption Commission (MACC), The Star reported him as saying. Bangladesh plans to relocate thousands of Rohingya who have spent years in refugee camps near the Myanmar border to a southern island, an official said on Wednesday. The government has started planning the relocation to Hatiya island in the Bay of Bengal, a move backed by Bangladesh Prime Minister Sheikh Hasina, the head of the government's Myanmar Refugee Cell Amit Kumar Baul said. "The relocation of the Rohingya camps will definitely take place. So far informal steps have been taken according to the PM's directives," Baul told AFP. Nazrul Islam was one of the lucky ones: He made it back to Bangladesh alive. Hundreds of others who sneak out on rickety boats either drown in Southeast Asia's seas or get dumped in mass graves like those discovered in Thailand and Malaysia this month. Islam, who took the journey in 2013, had no idea it'd be so bad. Malaysian police forensic teams, digging with hoes and shovels, began pulling out the remains of dozens of suspected victims of human traffickers on Tuesday from shallow graves discovered at a jungle camp near the border with Thailand. On Tuesday, the authorities took a group of journalists to one of the camps, nestled in a gully in thick jungle up a steep, well-worn path about an hour's walk from the nearest road. Apparently abandoned in haste, what remained of the camp was little more than a tangle of bamboo and tarpaulin, but one police official, who did not want to be identified, said it could have held up to 400 people. Indonesia expects Bangladeshi migrants who landed on its shores to be sent home in a matter of weeks once the necessary documentation is done, said an immigration official. 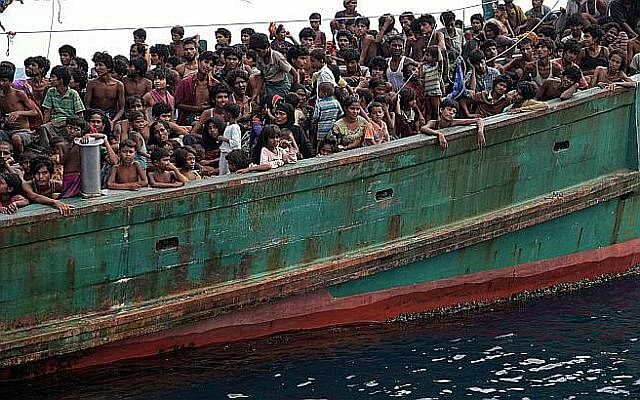 The Indonesian authorities consider the Bangladeshis to be economic migrants who undertook the treacherous sea journey to South-east Asian countries such as Malaysia to escape poverty at home. "The Bangladeshi government has committed to taking back all its citizens. Indonesia will do its best to help with the process," Mr Mirza Iskandar, investigation and enforcement director at the national immigration office in Jakarta, told The Straits Times. Malaysian police are working to determine whether the remains uncovered at 139 grave sites and 28 abandoned camps were those of Rohingya and Bangladeshi migrants, as the scale of the region's human trafficking trade begins to hit home. National police chief Khalid Abu Bakar said the remains were being exhumed and it remained unclear how many bodies might be buried in the area, located in a remote and hard-to-reach patch of mountainous jungle along the Thai border. "It saddens me... Even if it was just one person, it is still (considered) human trafficking and here we have 139 grave sites," Tan Sri Khalid told a press conference in the northern state of Perlis. KUALA LUMPUR - Malaysia said yesterday that it had found mass graves believed to contain the bodies of Bangladeshi and Rohingya migrants in the border town of Padang Besar in Perlis state. Inspector-General of Police Khalid Abu Bakar, who confirmed the news, is expected to hold a press conference today (Monday) to throw more light on the grisly discovery. Home Minister Ahmad Zahid Hamidi was quoted by The Star newspaper as saying the graves were found near suspected detention camps run by people traffickers. "But we don't know how many there are. We are probably going to find more bodies," he said. Commentary: Could Singapore do more to help the boat migrants? 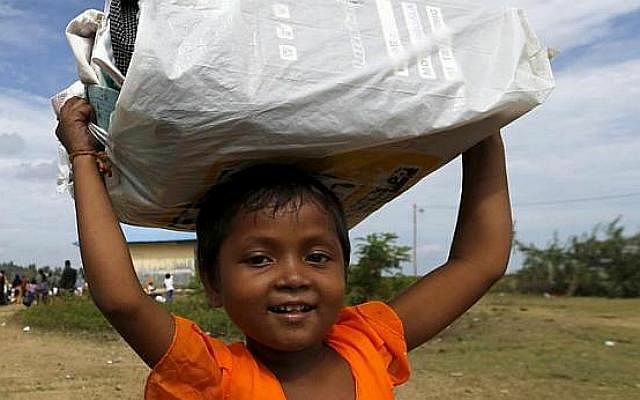 On Saturday, Foreign Affairs Minister K. Shanmugam revealed that Singapore has offered an initial US$200,000 (S$267,000) to support efforts to help the refugees. Singapore's Ministry of Home Affairs (MHA) had earlier stated that "as a small country with limited land, Singapore is not in a position to accept any persons seeking political asylum or refugee status, regardless of their ethnicity or place of origin". This is the same position outlined in Parliament in 2009, when then Nominated MP Eunice Olsen asked for the Government's response if the Rohingya tried to enter Singapore waters. The flight of African refugees is a phenomenon that has been ongoing since a large number of countries on that continent went from one conflict to another. What boggles the mind is when people from countries that are purportedly stable seek such desperate means as crossing the seas in dangerous vessels, all in the hope of making it to a liveable place. The Bangladeshi survivor of the Mediterranean shipwreck is a small example of the desperation of our own nationals to leave their country in search of a better existence. There have been many more like him who have tried, some successfully, to take a life-threatening journey across the continents to earn a living. But the story of the thousands now hitting the headlines, caught between life and death on the high seas of South-east Asia, is at a different level. Although a large number are reportedly refugees from Myanmar - the Rohingya - the rest are from Bangladesh, good and proper. TODAY the Asean region is confronted with the challenge of coping with Rohingya who have taken to the seas to seek a safer life elsewhere. At the same time, the European Union is forced to deal with the phenomenon of Africans fleeing their continent to seek a better life in Europe. In both these cases, the refugees concerned have been portrayed as vulnerable, homeless people who present a challenge to other countries that have become the destinations for them. For reasons that I will elaborate on, I find this depiction of the Other as the "vulnerable victim" problematic; and I would argue that at this critical juncture we need to seriously interrogate the very language that we use to describe and understand such crises. WASHINGTON (AFP) - The United States is ready to help South-east Asian countries "bear the burden" of a wave of sea-borne refugees, State Department deputy spokeswoman Marie Harf said Wednesday. Welcoming a decision by Malaysia and Indonesia to stop turning away migrants packed into rickety boats, Harf said the United States would help UN agencies to set up protection centers and would consider requests to resettle some refugees. "The US stands ready to help the countries of the region bear the burden and save lives today. We have a common obligation to answer the call of these migrants who have risked their lives at sea," she told reporters. Indonesia and Malaysia moved on Wednesday to end the humanitarian crisis in the Andaman Sea by agreeing to allow an estimated 7,000 boat people to come ashore, but on the condition that they be resettled or repatriated within a year. 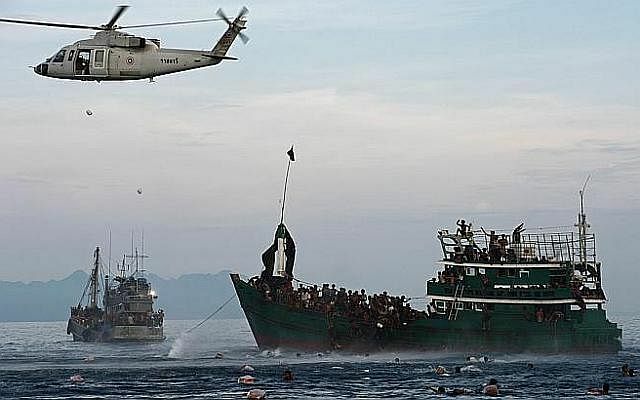 This came as Myanmar said it was "ready to provide humanitarian assistance to anyone who suffered in the sea", according to state media, climbing down from a hardline stance of refusing to accept any blame for the flight of the Rohingya. Speaking after a four-hour meeting with his Indonesian and Thai counterparts, Malaysian Foreign Minister Anifah Aman also stressed that the offer of "temporary shelter" was limited to those now adrift along the three countries' maritime borders and that "under no circumstances" would it be extended to "an influx" of other illegals. Hopes of some respite for thousands of illegal migrants from Myanmar and Bangladesh were raised yesterday. The Philippines said it was ready to accept them, while Indonesia hinted at the same if international aid was forthcoming. Philippine Justice Secretary Leila de Lima told reporters in Manila that she had met the United Nations High Commissioner for Refugees representative, Mr Bernard Kerblat, to discuss her country's offer, described as a "hopeful sign" by the International Organisation for Migration. LANGSA - Rohingya and Bangladeshi migrants on board a foundering vessel off Indonesia fought with axes, knives and metal bars in vicious clashes that left at least 100 dead, survivors said as they recovered from their ordeal. They described bloody, nightmarish scenes after the overcrowded vessel was abandoned by its crew last week, with desperate migrants "slaughtering" one another in fierce battles over dwindling supplies. 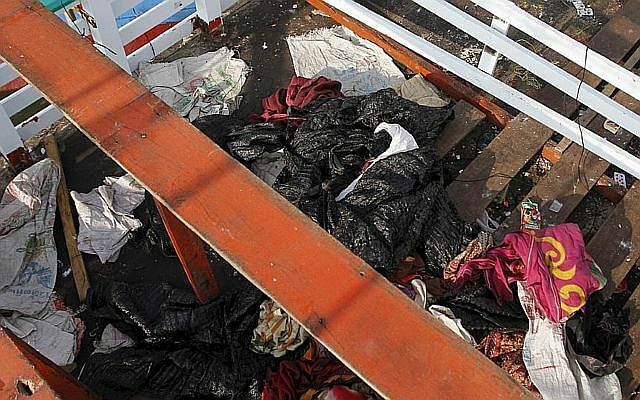 Exhausted survivors in camps in Indonesia's Aceh province, many bearing bruises and cuts, said they believed between 100 and 200 people were killed in the fighting last Thursday. Rohingya refugee Umai Somida, 15, and her two younger sisters have only one plan: go to Malaysia to reunite with their two older brothers who are construction workers in Kuala Lumpur. The decision for the three young sisters - the other two are 13 and 11 - to go to Malaysia was made in 2012 when their parents were killed in a mob attack in their village of Lolbina in the Maungdaw area in Myanmar. "They came at night," Umai told The Straits Times in Kuala Langsa in Aceh. "We hid to avoid the attacks. They slit our parents' throats." 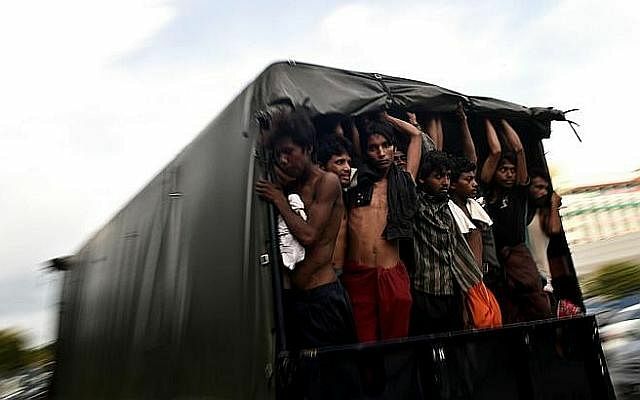 As Malaysia, Indonesia and Thailand plan for talks on the Rohingya migrant crisis, Singapore said it is unable to accept any refugees or those seeking political asylum. "As a small country with limited land, Singapore is not in a position to accept any persons seeking political asylum or refugee status, regardless of their ethnicity or place of origin," said a spokesman for the Ministry of Home Affairs yesterday, in response to questions from The Straits Times. The position appears unchanged from that outlined in Parliament in 2009, when then Nominated MP Eunice Olsen asked for the Government's response if the Rohingya tried to enter Singapore waters. At a small community school for Rohingya refugees in the outskirts of Kuala Lumpur, the 94 children are taught not just by Malaysian teachers, but also one of their own. Ms Ferozah Abdul Rashid, 25, came to Malaysia just four years ago to join her siblings and father, trading in her life as a stateless minority in Myanmar for that of a refugee in Kuala Lumpur. And she already speaks enough Malay and English to teach the local syllabus. "I have been interviewed to see if I can further my studies in America. I want to return to Myanmar, it is my home, but how can I when it doesn't accept us," she told The Straits Times in Malay. 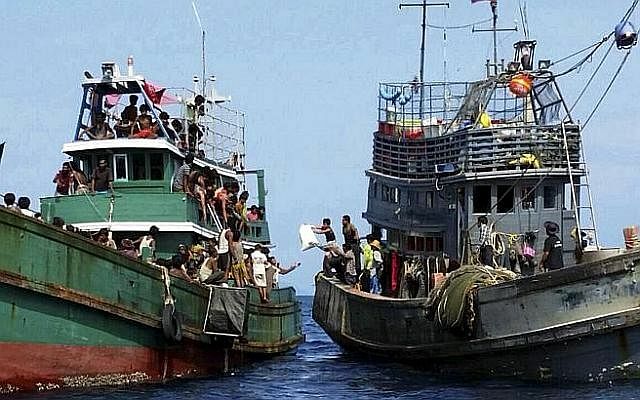 Members of Parliament from Indonesia's Islamic parties are exerting pressure on the government to allow boat people from Myanmar and Bangladesh to disembark on Indonesian soil. This comes as the military said it had prevented a suspected migrant boat from entering its waters at the weekend. Myanmar yesterday acknowledged international "concerns" about the wave of boat people and a spokesman for Ms Aung San Suu Kyi's opposition said they were entitled to "human rights", according to wire reports. A former Thai regional official accused of being a major people trafficking kingpin turned himself in on Monday, police said, as the kingdom continues a belated blitz against the lucrative trade. Pajjuban Aungkachotephan, better known as Ko Tong (Big Brother Tong), had been sought by police for the last week on human trafficking charges. "He surrendered to police this morning in Bangkok," national police spokesman Lieutenant General Prawut Thavornsiri told AFP. Malaysia will hold talks with Indonesia and Thailand this week as it seeks a solution to the crisis in the three countries' shared maritime border, where as many as 8,000 Rohingya Muslims from Myanmar as well as Bangladeshis are languishing in boats out at sea. Malaysian Foreign Minister Anifah Aman said on May 17 that he would discuss with his Indonesian and Thai counterparts ways to end what the United Nations has warned could result in a massive humanitarian crisis. He was speaking to reporters after meeting Bangladeshi Foreign Minister Abul Hassan Mahmood Ali in the Sabah capital of Kota Kinabalu. Endemic poverty in the Rakhine state - the Cox's Bazar region on either side of the Myanmar-Bangladesh border where it meets the Bay of Bengal - afflicts local people across the board. But activists say it is Myanmar's "one step forward, two steps back" policy in dealing with the long-running Rohingya issue in Rakhine that is driving the near-destitute minority Muslim people to leave in increasing numbers. ST's Indochina Bureau Chief Nirmal Ghosh examines how the crisis presents a test for Asean as a whole. For several days, the fate of roughly 300 desperate Rohingya and Bangladeshi migrants has been subject to a repetitive dance in waters just out of sight of gleaming Thai beach resorts. Their boat, which those on board said had been at sea for up to three months, was found drifting last Thursday off Koh Lipe island, near the Malaysian border, with parts of its engine missing. Thai sailors fixed the engine and handed the migrants food and water, before turning them back out to the Andaman Sea. That was the beginning of what local Thai navy chief Veerapong Nakprasit calls "a cycle", with the overcrowded fishing vessel bouncing between the waters of two countries, both determined not to take the migrants in. 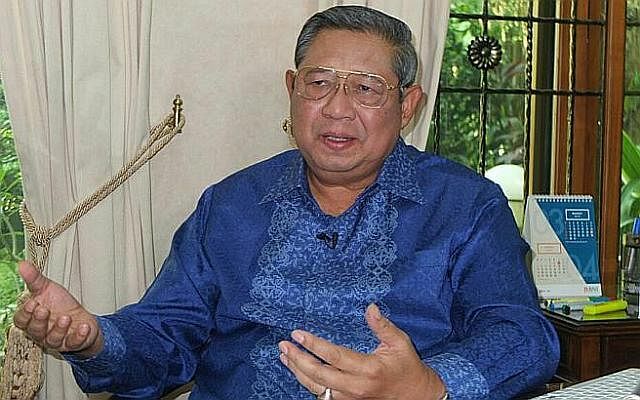 Indonesia's former president Susilo Bambang Yudhoyono urged nations to seek a solution instead of assigning blame over the migrant crisis engulfing Southeast Asia, warning that hundreds of lives are at stake. Malaysia, Indonesia, and Thailand have triggered international outrage by turning away boatloads of desperate Rohingya migrants from Myanmar as well as Bangladeshis, who are now in limbo at sea with little food and nowhere to go. Yudhoyono, whose presidency ended in October after 10 years as leader, said the situation - South-east Asia's biggest migrant crisis since the end of the Vietnam War - needed an urgent regional response, not endless finger pointing. Harrowing tales emerged yesterday of people killing and throwing one another overboard after more than 700 migrants aboard two vessels were rescued and taken ashore in Aceh, in northern Sumatra. Turned away from Malaysian waters and carrying 712 people, including 61 children, one vessel was sinking when it was sighted by Indonesian fishermen, who took survivors ashore, according to local reports. Forty-seven others from another vessel were rescued after they leapt into the water pleading for help. 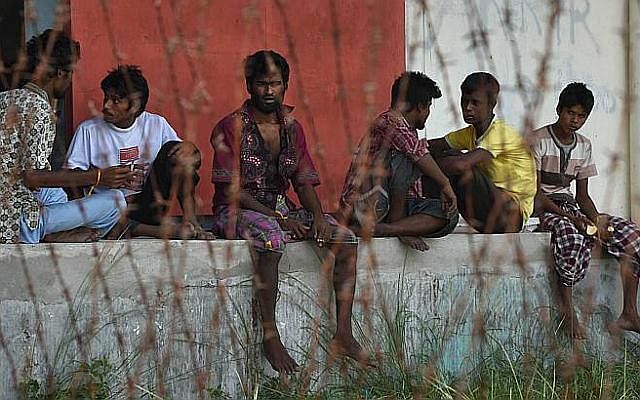 As legal channels for labour migration from Bangladesh have shrunk due to malpractices in the arrangements by both private agencies and the government, desperate jobseekers take the dangerous sea route to Malaysia. Dreaming of high-paid jobs, they fall prey to a third party - transnational gangs pledging a secure sea voyage - and end up in a vicious web of abuses, including torture and captivity en route, forced labour or humiliating deportation. Manpower export from Bangladesh to Malaysia has always been fraught with anomalies since it formally began in 1992. Corruption by some Bangladesh High Commission officials in Kuala Lumpur left as many as 50,000 workers illegal in 1996. Thai police have stepped up a manhunt for the alleged kingpin of a Thai people smuggling network, as detectives probe whether a private island near the Malaysia sea border was a key link in a trafficking chain spanning several countries. Police believe Pajjuban Aungkachotephan, a one-time senior provincial official known locally as Ko Tong (Big Brother), has fled the kingdom since a warrant for his arrest was issued on Saturday. The probe is examining whether Ko Tong used the small island near the Malaysian sea border as a base to mastermind a trafficking network which has unravelled since May 1 when dozens of migrants' graves were found on the nearby Thai mainland. Over the centuries, millions have made the perilous journey from South Asia across the Bay of Bengal to South-east Asia in search of trade, employment and better lives - sometimes voluntarily, sometimes driven or forced by circumstances. Every year, thousands of the near-destitute, usually stateless minority Rohingya on both sides of the Myanmar-Bangladesh border - and poor Bangladeshis too - board smugglers' boats for a few US dollars or even free of charge, having been told they can pay later. For most, the destination is Malaysia, which until this week had been accommodating. In recent days, some 2000 refugees and migrants from Bangladesh and Myanmar have come ashore in Aceh, Indonesia, and Langkawi, across the Strait of Malacca in Malaysia. Thousands more are feared stranded on the high seas. A maritime crisis has been brewing in the waters of the Bay of Bengal for some years now, but it was rarely reported. All eyes have been on the "boat people" arriving on Australia's doorstep and more recently on those making it to Europe across the Mediterranean. Why are people risking their lives at sea? PETALING JAYA - Bangladeshi national Mohd Rashid was looking for work to support his family when a man offered him passage to Malaysia for a pittance. The 26-year-old made the treacherous voyage with more than 400 others in a boat that set sail from the southern coastal town of Teknaf - but ended up half-starved and even poorer. Mr Rashid can be considered lucky. Some of those who made the trip with him died of sickness and starvation, and their bodies were tossed overboard. LANGKAWI, Malaysia (AFP) - Malaysia on Wednesday joined Indonesia in vowing to turn back vessels ferrying a wave of migrants to Southeast Asian shores, deepening the misery facing boatloads of people who advocates say are at risk of starvation and disease. Thailand has called for a May 29 regional summit to address what it called an "unprecedented increase" in arrivals of ethnic Rohingya refugees from Myanmar and impoverished Bangladeshi migrants. PETALING JAYA (THE STAR/ASIA NEWS NETWORK) - Two policemen were among the 38 individuals arrested for human trafficking activities in northern Malaysia and south Thailand. In a statement Wednesday, Malaysia's Inspector-General of Police Tan Sri Khalid Abu Bakar said close cooperation and partnership between the Royal Malaysian Police and the Royal Thai Police resulted in seven human trafficking syndicates busted. "The suspects - 21 Myanmarese, 16 Malaysians and an Indonesian - were picked up between March and April this year. LANGKAWI (AFP) - South-east Asian governments on Tuesday faced international appeals to rescue thousands of migrants believed to be stranded at sea without food and water, with warnings that many may die if action is not taken. The escalating alarm over the region's refugee crisis came as Indonesia's navy said it had turned away a boat carrying hundreds of migrants from Myanmar and Bangladesh to an uncertain fate. Nearly 2,000 boatpeople from Myanmar and Bangladesh have swum ashore, been rescued or intercepted off Malaysia and Indonesia in recent days after Thailand - a key stop on human smuggling routes - launched a crackdown on the trade. LHOKSUKON, INDONESIA/KUALA LUMPUR (REUTERS) - Thailand and Malaysia may set up camps and detention centres to shelter hundreds of refugees arriving on their shores, officials said on Tuesday, as a leading inter-governmental agency said about 7,000 boatpeople were still adrift in the Bay of Bengal. There has been a surge in refugees arriving from impoverished Bangladesh and Myanmar to Malaysia and Indonesia following a crackdown on trafficking by Thailand, usually the first destination in the region's people-smuggling network. Three boats carrying more than 1,000 people landed on the Malaysian resort island of Langkawi, close to the Thai border, at the weekend. There has been an increased influx of boat people arriving in Malaysia and Indonesia after Thailand announced a crackdown on people smuggling. Most of the boat people are believed to be from the Rohingya ethnic Muslim minority group in Myanmar. BANGKOK (AFP) - Nearly 2,000 boat people from Myanmar and Bangladesh, many thought to be Rohingya, have been rescued off the coasts of Indonesia and Malaysia since Sunday. Scores more have been found dazed and malnourished across southern Thailand this month. They are all believed to have been abandoned by people traffickers fearing a crackdown on their lucrative trade. Sittwe is a huddle of ancient, sagging wooden houses, stained colonial bungalows and tall, old trees full of big fruit bats and noisy crows. It has a crowded bazaar. It is also where the borderless sprawl of the Kaladan River meets the roiling waters of the Bay of Bengal.